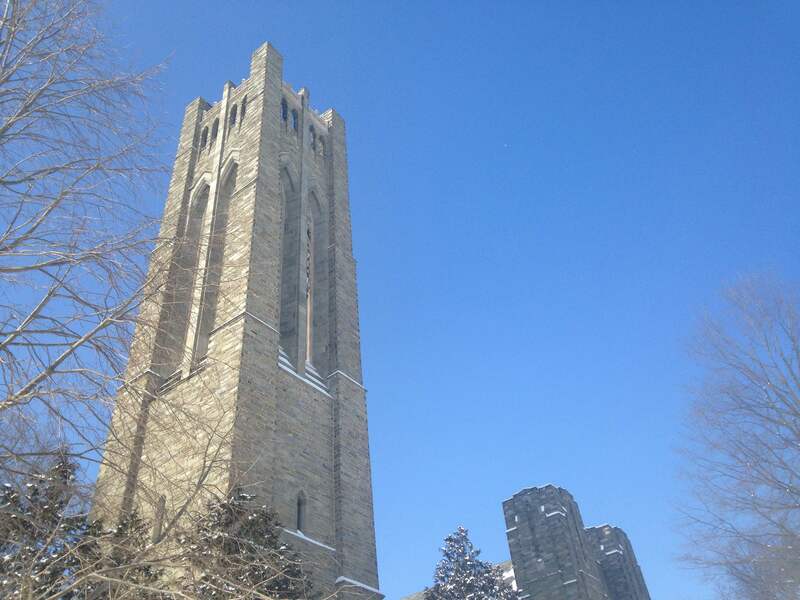 In celebration of Peace Day 2016, International Day of Peace, at noon on Wednesday, September 21st, Swarthmore College bells will ring in solidarity with the ringing of bells for peace worldwide. The United Nations Association of Australia Peace Program initiated the ringing of the peace bells worldwide last year on Peace Day. Bells around the world will sound alongside of bells of Sydney University, St Jones Cathedral located in Brisbane Australia and St Mary’s Cathedral in Sydney CBD. There is strength in unity and the sound of peace bells ringing throughout the world will focus on the importance of peace in our lives. 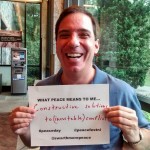 Also, on Wednesday, Sept. 21 from 7:30-9:00 p.m., a “Choose Peace Concert” will be held at the Swarthmore Friends Meetinghouse on the Swarthmore College campus. What is visionary peace and what are the choices we can make to live our lives into such a possibility? We are invited to explore linking the cultivation of personal peace to identifying innovative steps toward global peace through song with Rev. Rhetta Morgan, singer, songwriter, interfaith minister, and activist. 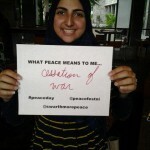 These events are sponsored by the Swarthmore College Peace and Conflict Studies Program. 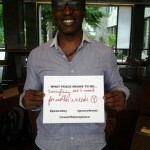 Please contact Ellen Ross, Coordinator, Peace and Conflict Studies, eross1, if you have any questions. What is visionary peace and what are the choices we can make to live our lives into such a possibility? 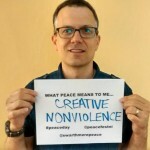 We are invited to explore linking the cultivation of personal peace to identifying innovative steps toward global peace through song and writings with Rev. Rhetta Morgan, singer, songwriter, interfaith minister, and activist. There will be a time for some audience members to read a quotation about peace that has deepened the meaning of peace for you, that has changed your life, or that has opened or broadened your thinking about or experience of peace. 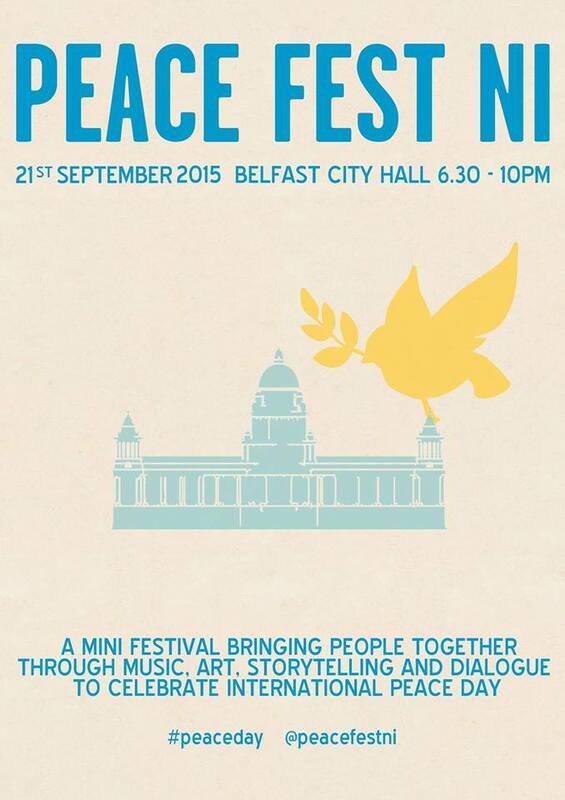 Or you may like to share a poem about peace or a brief paragraph about peace that you have written. To help with the planning, please send your name and what you’d like to read to Ellen Ross at eross1, by September 16th so that we can arrange the reading order. Many thanks! Rev. 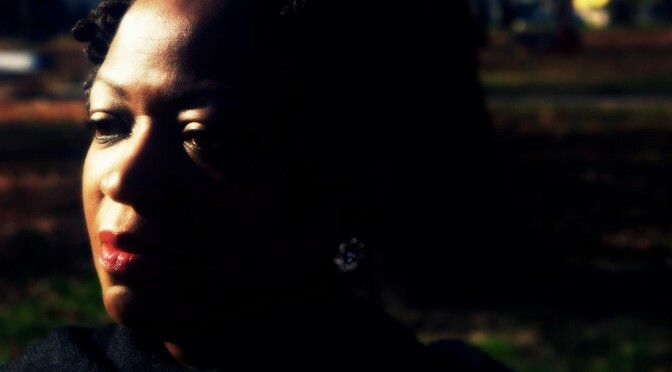 Rhetta Morgan is Founder of the While We Wait Project sponsored by a Leeway Art for Change grant. 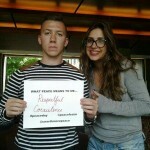 The Project provides spiritual and emotional support to loved ones of incarcerated individuals. 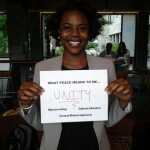 She has facilitated conversations on race and healing for the Interfaith Peace Walk and other organizations. She recently performed for the Leeway + Bread and Roses Town Hall on Incarceration and Gender, using her voice to create inclusive sacred space. Rev. Rhetta performs and works with Girls Rock Philadelphia, an organization that supports and empowers girls and young women. 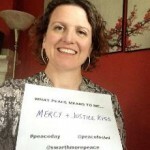 She has worked with Earth Quaker Action Team (EQAT) and Philly Thrive as both musical leader and spiritual anchor. Rev. Rhetta mentors and counsels activist leaders in our area, encouraging self-care and what she calls a spiritual tool box to aid against despair, overwhelm and depression. A leader in the Philadelphia area, Rev. 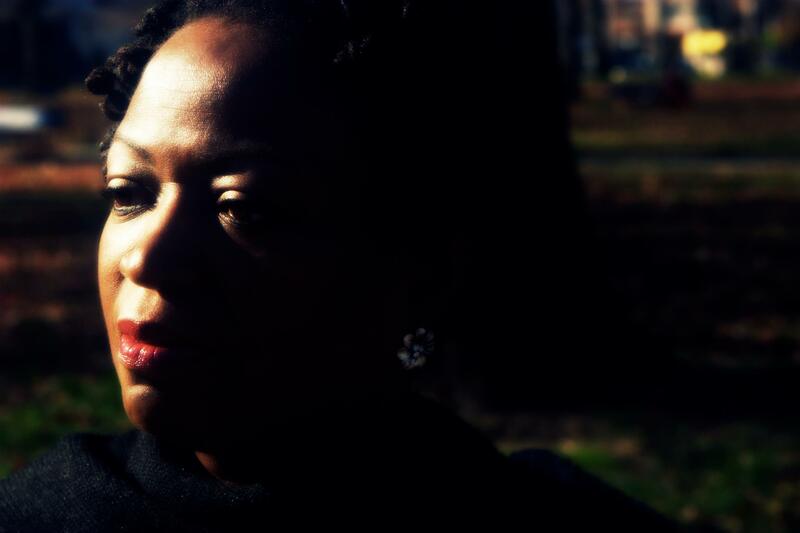 Rhetta uses music she writes and sings to inspire and heal. 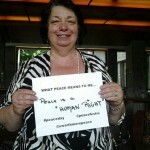 For other International Peace Day Events in the Philadelphia area, see Peace Day Philly. 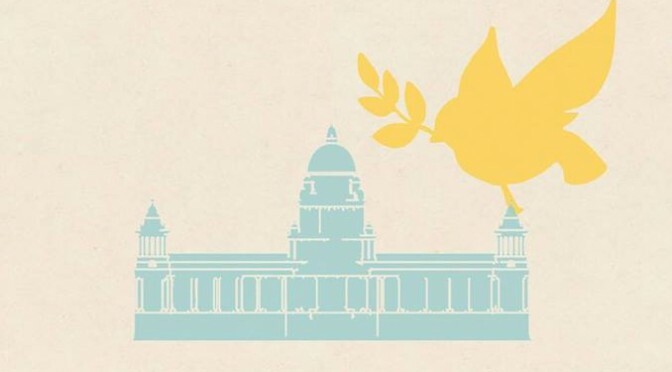 It has become our tradition in Peace and Conflict Studies to join Peace Day Philly and celebrate the International Day of Peace on September 21 each year. 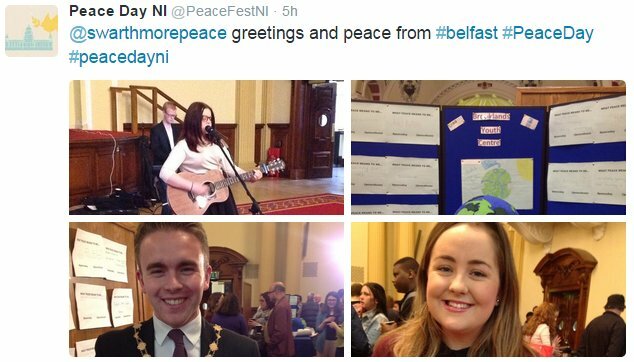 This year, we will celebrate with Northern Ireland as they hold a gala event in Belfast City Hall. The youth organization, Public Achievement, have organized a stellar night of bands and speakers that they will broadcast live via the internet from 1:30 to 5:00 p.m. EST. 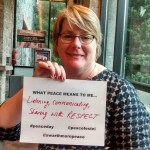 As you buy a coffee or pass through Kohlberg Coffee Bar on Friday September 21, stop by the Peace Day table to watch the broadcast (or stop back by this blog post, where we hope to embed the livestream). We have sent a brief video greeting to the organizers. 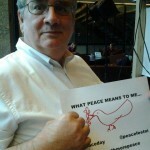 See you on the International Day of Peace! A film about the transnational peace work of Thich Nhat Hanh, Sister Chan Khong, and Alfred Hassler. Download a flyer and help advertise the event. 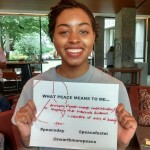 Each year, we mark the International Day of Peace at Swarthmore College as part of Peace Day Philly. 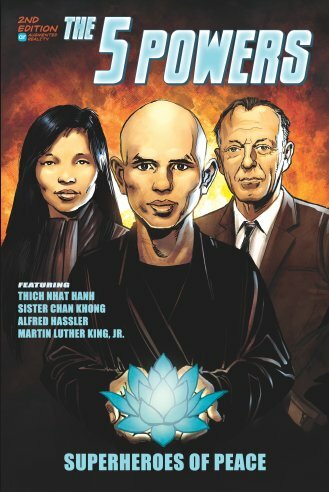 This year, we will screen a new documentary film, “The 5 Powers” about the transnational peace work of Thich Nhat Hanh, Sister Chan Khong, and Alfred Hassler during the Vietnam War. Discussion with the producers of the film (Anthony Nicotera, Gregory Kennedy-Salemi, and Stuart Jolley), Laura Hassler ’70, and George Lakey (who worked with Alfred Hassler of the Fellowship of Reconciliation) will follow the screening. 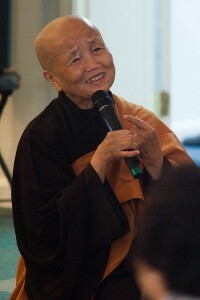 The 5 Powers film is organized around central tenets of Buddhist philosophy and features a captivating mix of comic book style animation (by Dave Gibbons of Watchmen fame), live interviews, archival audio, photos, and documents, some of which were procured from the Peace Collection at Swarthmore. For parking: See the campus map at http://www.swarthmore.edu/campusmap/ Enter campus at the NORTH ENTRANCE and follow the drive, Whittier Place, to the first large parking lot on the right. For drop-off, continue to follow Whittier Place, turning right at the corner of the parking lot. The drive will proceed around the back of several buildings to a circular turn around at the Lang Performing Arts Center. 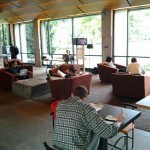 For more information about accessibility at the Lang Performing Arts Center, visit http://bit.ly/1uKd9uR For those parking in the large lot, walk to the corner of the lot, cross the street, and proceed diagonally across the quad to the Lang Performing Arts Center. The cinema is located just to your left as you enter the main lobby. We would like to thank author Mary Walton for her lecture this afternoon on the courageous work of Swarthmore alums Alice Paul ’05 and Mabel Vernon ’06 in their organizing and nonviolent campaigns to secure the vote for women in the United States. A standing-room only crowd of people from the Swarthmore community and the local community gathered in the Scheuer Room to celebrate the International Day of Peace, the College’s sesquicentennial, and 125 years since the first peace studies course in higher education was taught at Swarthmore. The audience expressed their appreciation for Ms. Walton’s presentation with extended applause. We would like to thank all of our co-sponsors who made this event a success, including Peace Day Philly for including our event in the city-wide celebration of the International Day of Peace. Sponsors: Peace and Conflict Studies, the President’s Office, Swarthmore College Peace Collection, Friends Historical Library, History Department, Gender and Sexuality Studies, Women’s Resource Center, Lang Center for Civic and Social Responsibility, English Literature Department, and Political Science Department. September 19, 2013; 4:15 p.m.
On September 19th, Peace and Conflict Studies and co-sponsors will celebrate the International Day of Peace, 125 years of peace and conflict studies at Swarthmore College, and the start of the College’s Sesquicentennial with a talk by Mary Walton, author of A Woman’s Crusade: Alice Paul and the Battle for the Ballot. The focus of Walton’s talk will be Alice Paul (Class of 1905) and her friend and fellow Swarthmore alum, Mabel Vernon (Class of 1906). A New Jersey Quaker, Alice Paul was the leader of the militant wing of the suffrage movement from 1913 to 1920. Hers was a David-and-Goliath struggle to convince a reluctant congress and a stubborn president to give women the vote. Paul and her followers were the first people to picket the White House. They were arrested, thrown in jail, brutalized and force fed when they went on hunger strikes. A pioneer in non-violent resistance, she was to suffrage what Gandhi was to Indian independence, what Martin Luther King Jr. was to civil rights. In 1913, Mabel Vernon gladly gave up teaching to join her college friend, Alice Paul, in working full time for the Congressional Union. From that day on, she devoted her life to suffrage and other causes. Mabel Vernon was among the most militant suffragists. In 1916, she stood up in a full auditorium and heckled President Wilson as he spoke about democracy. Vernon picketed the White House and was among the first suffragists to go to jail. 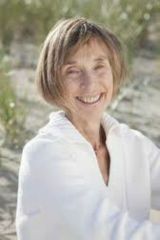 Mary Walton is the author of four previous works of nonfiction. She was a reporter for the Philadelphia Inquirer for many years where she wrote more than a hundred magazine stories as a staff writer for the Sunday Inquirer Magazine. 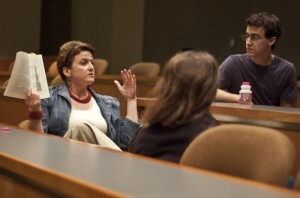 She has also written for the New York Times, Washingtonian, theWashington Monthly, and the American Journalism Review. After graduation from Harvard University, and a turn at social work and community organizing, Walton began her journalism career in 1969 as a reporter for the Charleston (WV) Gazette. 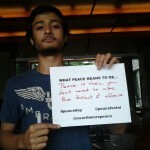 How Do We Measure Peace? Intro PCS students, check out this event next week at U. Penn. since you’ve read the U.S. Global Peace Index report. 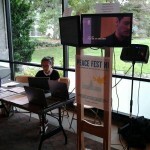 See the announcement at The Peace Day Philly site. While the drivers and impact of violence receive widespread attention, there is comparatively little research on the factors that create and sustain peaceful societies. 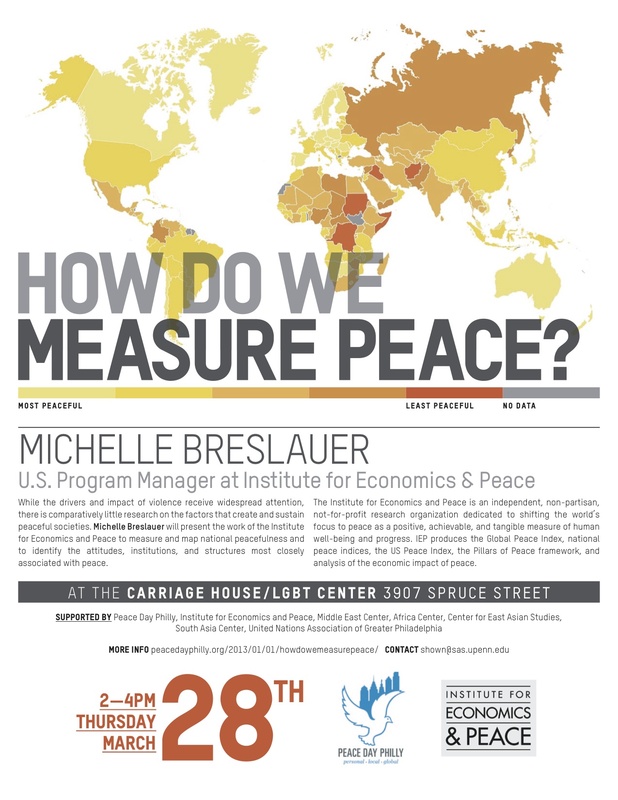 Michelle Breslauer will present the work of the Institute for Economics and Peace to measure and map national peacefulness and to identify the attitudes, institutions, and structures most closely associated with peace. The Institute for Economics and Peace is an independent, non-partisan, not-for-profit research organization dedicated to shifting the world’s focus to peace as a positive, achievable, and tangible measure of human well-being and progress. IEP produces the Global Peace Index, national peace indices such as the US Peace Index, the Pillars of Peace framework, and analysis of the economic impact of peace. Michelle Breslauer represents the programs of the Institute for Economics and Peace (IEP) in the Americas, including IEP’s US-focused research. Michelle has significant experience managing complex communication strategies on an international scale, including a 5-year tenure at the 9/11 Memorial & Museum at the World Trade Center. She has also consulted for various humanitarian initiatives, advising on strategic planning and external affairs for both public and private clients. 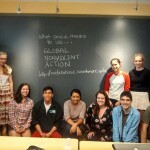 She presents frequently to groups working in academia, policy, and international development. She has completed research around social capital and urban development for her master’s degree from The London School of Economics. She also holds a bachelor’s in International Affairs from the American University of Paris. 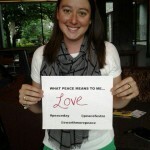 I just wanted to draw everyone’s attention to the fact that this Friday, Sept. 21 is International Peace Day. Richard Unsworth, author of A Portrait of Pacifists: Le Chambon, the Holocaust and the Lives of Andre and Magda Trocme (Syracuse University Press, 2012) will visit Swarthmore College on September 20, 2012, to talk about this new book. Unsworth, grandfather of Hannah Gotwals ’13, and a senior fellow at the Kahn Liberal Arts Institute at Smith College, taught religion at both Smith and Dartmouth Colleges. He served as headmaster and president of Northfield Mount Hermon School. 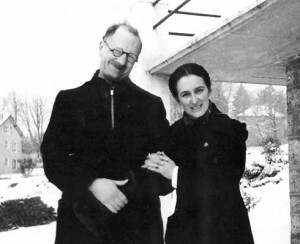 His years of involvement with the College Cevenol in France led to a friendship with Andre and Magda Trocme. 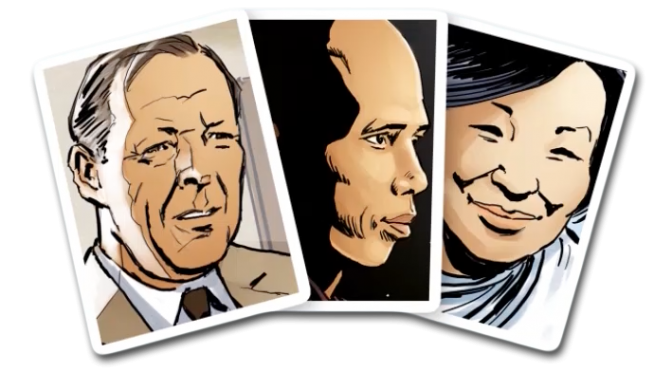 A Portrait of Pacifists tells the story of Andre and Magda Trocme, two individuals who made nonviolence a way of life. During World War II, the southern French town of Le Chambon-sur-Lignon and its surrounding villages became a center where Jews and others in flight from Nazi roundups could be hidden or led abroad, and where children with parents in concentration camps could be nurtured and educated. The courage pf Andre and Magda during World War II has been well documented in books and film, yet the full arc of their lives, the impulse that led them to devote themselves to nonviolence and their extensive work in the decades following the war, has never been compiled into a full-length biography. Based on their papers in the Swarthmore College Peace Collection, including their unpublished memoirs, interviews, and the author’s research, the book details the couple’s role in the history of pacifism before, during, and after the war. 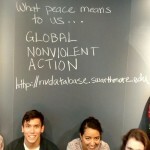 Unsworth traces their mission of building peace by nonviolence throughout Europe to Morocco, Algeria, Japan, Vietnam, and the United States. 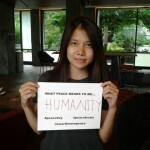 To mark the International Day of Peace on September 21, Swarthmore students and faculty gathered in the Science Center to view the film, Peace One Day, that documents the journey of Jeremy Gilley as he lobbied world leaders and organized grassroots supporters to formalize an international day of peace under the auspices of the United Nations. An introduction and a presentation by Gilley are available below. 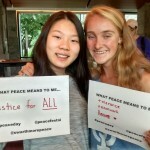 Peace and Conflict Studies Professor Jennifer Magee and students appeared in the “This Week in Pictures” coverage of the event in The Phoenix. Conversation with Max Elbaum, longtime left organizer and author of Revolution in the Air: Sixties Radicals Turn to Lenin, Mao and Che.